97% of the Fortune 500 companies have been hacked, said Sanjay Sahay. Lucknow: As part of the Uttar Pradesh Police Week celebrations in Lucknow, senior officers today discussed the challenges they face when it comes to solving cybercrime and how even well-protected organisations are vulnerable to hacking. 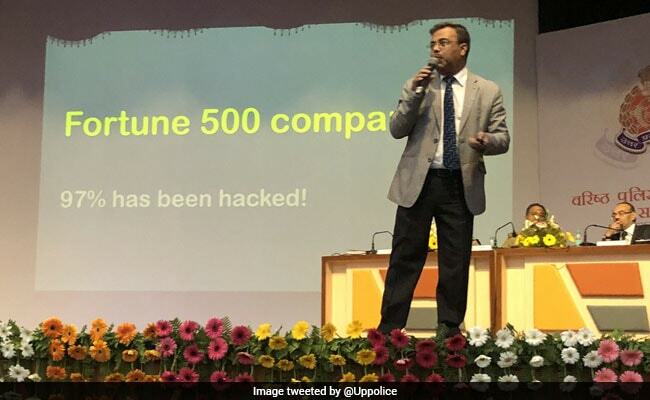 "97% of the Fortune 500 companies have been hacked," said Sanjay Sahay, IPS (Indian Police Service) officer, ADG (Additional Director General of Police) Lokayukta, Karnataka, during a panel discussion. He added, "Getting hacked is the new normal. Human factor is the weakest link in cybercrime. And digital battlefront will remain the real battle in days to come." The panellists discussed various aspects of cybercrime -- legal, forensic, investigation, administrative and judicial and the need for a data protection law. The current provisions of IT Act are not sufficient to deal with the variety of cybercrimes, said Pawan Duggal, cybercrime expert. "We must revisit the IT Act. We need dedicated cybercrime courts. The government has already announced amendment of IT act," he said. The biggest challenge from the point of view of police, Mr Duggal added, is the detection of cybercrime, investigation and prosecution. "Several gaps remain in all the three which weakens the case in court," he said. Senior police officer Arvind Chaturvedi agreed with Mr Duggal and said, "Cyber forensics is of extreme importance in investigation of cybercrime." But evidence retrieved in several cases is not acceptable in the court of law, said Krishna Sastry Pendyala, cyber expert. "Drones will deliver Pizzas in days to come and it is also prone to getting hacked, where someone will pay for pizza and it will be delivered at someone else's place," he said.